You saw an amazing picture and wanted in on a custom t-shirts? Maybe not just on one T-shirt but maybe more, like for your whole family or maybe for a whole team or a big event and you don’t know where to go too? Well, you are in luck, ezprinters provides you with custom printed T-shirts. Be it in small quantities or large, we always provide the highest quality printed T-shirts in the business. You can create your printed shirt. The way you wanted it. Surprise your loved ones with their favorite characters on a shirt. Or just an amazing quote, you know like quote shirts that everyone is wearing nowadays (most probably have them from our shop). When it comes to printing shirts your creative possibilities are unlimited for sure. All you need is to find the right images or create them. After that, it’s all up to us to print it on your shirts. And send them to you in a timely manner. It is a great gift for your whole family. As you can make each of your family members a personalised t-shirt that will sweep them off their feet. Our printing machines can handle even bigger orders. If you plan to make some shirts for your team or for members of an organization or planed event. We can support you and provide you with quality products, easily customized and optimized to your preference. 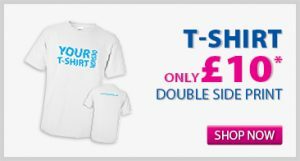 We are specialised in any order size and are always ready to start creating your ideal t-shirt for you as soon as you decide what you want you can send us the image and we will start printing for you or for your whole team. There are a few who can compare to our quality and our easy-to-use procedure that will make your ordering so much easier, just find the image you like and send use our site to post an order and we will start making your shirts and send them to you as soon as they are ready. Really good ! loved their design idea and way of finishing the job. Prefecto!!! 100% cotton t-shirt and very decent quality. They have taken a x30 t-shirts last minute order and delivered on time. Thumbs UP! Quality t-shirts and print, quick turnaround. ez printers is my recommendation for t-shirt printing.